Following the departure of Solicitor General Hugh M. Dorsey for Atlantic City Saturday afternoon, Col. Thomas B. Felder left Sunday afternoon at 5:10 o’clock for Cincinnati. He said that his trip had no connection whatever with that of the solicitor general. He would not disclose his object in going to Cincinnati, however, and said only that he would be in the Ohio city for several days. Business was his motive in leaving, he declared, although he would not tell what business he intended to transact. Colonel Felder declares that the affidavit which an Atlanta paper, on Sunday morning, accredits George Gentry with having made, verifies his own contention. “It supports me in every particular,” he said. “It corroborates my statement that Gentry is willing to return to Atlanta at any time the grand jury or any other investigating committee needed him; that he is passing under an assumed name in Washington, and that he was striving to keep out of the reach of certain Atlantans who are endeavoring to find him. “He even admits in this last affidavit that the dictagraph reports were padded. He says that charges were made, although it is intimated that they were immaterial. He acknowledges having signed Miles’ affidavit, and says that it was correct thoroughly. This, in itself, is all the support I would ask of Gentry. The affidavit obtained by Detective Miles is proof positive that the reports were padded—that is an established fact. 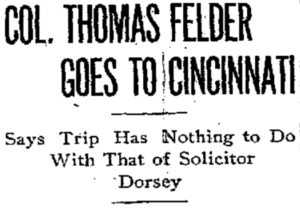 Colonel Felder would not talk regarding his trip to Cincinnati.